You can edit parameters for new and existing score sets in the Score Sets window. To rename the score set: Double-click the name in the left column of the Score Sets window, then enter a new name in the field. To place the insert mark: Click the narrow column to the left, or make multiple selection marks by dragging vertically. Instrument: This column shows which instruments are included in the score set, and their (vertical) order of appearance in the score. Track instrument icons are also displayed in this column, at the highest zoom level. To set the full name: Click the Full Name column to open a name field. By default, the name of the track instrument is used for the instrument name in the score. 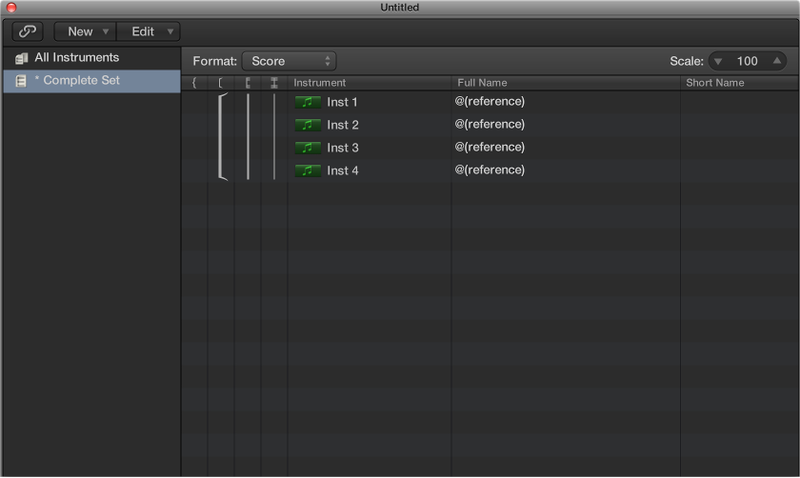 To change the name, select the default “@(reference)” text, and enter a new name. To set the short name: Click the Short Name column to open a field where you can enter the short name. The short name for each instrument is used if Short Names is chosen in the Project Settings > Score, Numbers & Names > 1st Staff and Other Staves pop-up menus. To set which staffs are connected by brackets and bar lines: Drag vertically in the appropriate column, until you see the appropriate display. You can define which staffs in the score set are connected by brackets or bar lines (either at the beginning of each staff, or throughout), in the last four columns. Brackets and bar lines can also be interrupted between staffs, allowing you to form groups of connected instruments in a score. If you want to delete a line or bracket, grab the corresponding symbol at its end point (bottom), and drag it upward, until it disappears. You can use the same method to shorten lines. 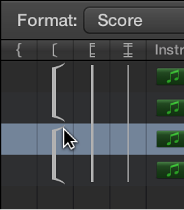 Bar line connections can also be edited directly in the score. Click the upper end of a bar line to connect it to the next (higher) staff. Repeating the procedure disconnects the bar lines.